Audience Center 360 is a data management platform designed to offer the capability to unify data from analytics, ads, email, social, and CRM to better understand and reach customers. Work for Google Audience Center? Learning about Google Audience Center? "Great Product Must Study to Use it"
It’s a very complete product which will help you manage better your websites, I mainly use the analytics part however it’s extremely complete and can be as complex as you want it to be, however I do recommend reading the tutorials and maybe even take a class on it to get its full potential. It can turn really complex and you can easily mess things up if you are not trained properly, so I recommend a good setup and know really what you change if you make any changes. Since it’s a Google product it allows you to target specific audiences and it’s extremely powerful regarding the analytical part and groups, just make sure you are instructed correctly before deploying to avoid any mistakes. It allows me to target and engage particular clients and track and target them. This also helps me tailor offers for specific groups and also allows me to keep track and even create groups that I didn’t know they existed. "Great tool for internet marketers"
I like the best the preview of gathered data. Everything is so compact and understandable. You do not have to be an analytics expert to understand the data. Sometimes it is a little bit dificult to extract certain data. For instance it is not that easy to constact own dashboard. I am in russian-speaking country and people in here do not always know english, but there is few learning materials in russian. I highly recommend Googly Audience Center to people who want to know insights about their own business and implement that knowledge in further imporvement of it. Just in 2-3 clicks you cand find out so many usefull information, for instance, about you cliens, incoming trafic sources and etc. I use Google Audience Center in my business everyday. I analyze data it gathers in a place and use that data to improve quaility of my ads. I am in online business, we sell online tickets for and events, thus data is very important for us. 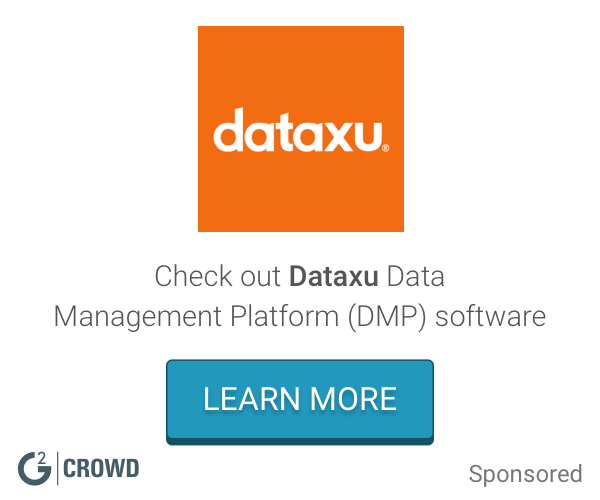 What Data Management Platform (DMP) solution do you use? "Best services and coolest features for the one having multiple websites"
They have provided with every feature which are in need for business analystics. This product also have its own app so that every costumer who uses it have a benefit of accessing it on any device no matter whether they have a laptop or mobile. So what are you waiting for ? Go ahead as I would like to recommend it to fullest and also wanna add that we uses Google Analystics for our websites. The app and websites both are good. But google can make website more attractive and hasslefree. There is not much disliking points but yes they have a great platform building skill from which every costumer get satidfied. I would like to recommend it to the all my fellows who really want t product from where you can measure the growth of audience in your website. You can easily compare your website traffic and can focus on the important ones. Using google audience centre we use to measure the growth of audience on our website and also uses it so that we get a good mark of maximum and minimum point of crowd on which website. From this we come to know about the needs and requirements of websites. Also we can easily focus on the website which have more audience rather than to run here an there for correct data. Now we can easily see and compare growth of all websites o single platform. "Google Audience Center Review - well worth it"
I like the way it works within the Google 'ecosystem' of products. It integrates , but also allows some granularity of each component, especially for reporting purposes. This includes both Google and 3rd party data which is critical for us, as we utilize audience segmentation. "100% love and recommend to anyone"
I love the ease of use and how factual it is. As a blogger and influencer, website views are one of the most vital pieces of information I need to connect with brands and analyze what my audience likes. "Great Product with a Learning Curve "
I like how because it is Google, Audience Center easily and often automatically integrates with all other Google products. If you use Google Ads or Google Express this will help you understand your customers. There is a large learning curve, and it takes a lot of learning to get the product to where it is really useful. The simplicity that Google has created in some many of its products, is not present here. Take the time to get the certification and budget enough time to learn the process, it might take a little longer then you think. Google Audience Center was used as a data management platform, collectings and organizes all customer data sources. "Great site for data tracking"
I love the real-time data tracking and measurements. I wish there was a better integration between the audience center and other CRMs. We have a more in-depth look at our website visitors. Truly understand my customers and what they want based upon the analytics of my social media engagement. It can be a little unclear sometimes as to what works. It's everything you already use with google but using their software to analyze your social media to see what works with your pitch to your audience or customer database. I didn't have to learn a whole new software as it's already user friendly as I am accustom to google software. Plus you don't have to switch platforms. Might as well use all the same thing. Knowing which ones cause the most to click and open up their messages or emails. If you are into data and analytics, the amount of data that can be extracted is absolutely amazing. Sometimes the program can be a little difficult to pinpoint exactly what you want to find. Do it. Once you start getting the analytics you won't be able to stop checking this site. We use it to track website information and statistics. It keeps us in the know about who is accessing our products. Simple to use, user interface with a lot of useful features. Mobile version of the app would make use more efficient. It offers you insight on your audience, who they are, their demographics and that can better tell you how to create content that is geared towards them and how to better market your products/services to them. Allows users to monitor and track their audience. "One of many audiences. " Easy to use since it's a Google product. Some of the tabs weren't really understandable for a novice user. You must do your research and have a clear list of your needs and expectations. We wanted to track gym and group exercise usage. We were able to run metrics on where these members joined or how they became aware of the brand and products. * We monitor all Google Audience Center reviews to prevent fraudulent reviews and keep review quality high. We do not post reviews by company employees or direct competitors. Validated reviews require the user to submit a screenshot of the product containing their user ID, in order to verify a user is an actual user of the product. Hi there! Are you looking to implement a solution like Google Audience Center?